"This recipe uses a make ahead mix that can be stored in the refrigerator for up to 4 weeks. Add the ingredients listed below to the make ahead mix for delicious Toffee Bars." Preheat oven to 350 degrees F (180 degrees C). Grease a 9 x 13 inch pan. Combine Make Ahead Cookie Mix with brown sugar, butter, vanilla and egg. Mix well. Spread dough in pan. Bake 17 to 24 minutes until top springs back when touched. Immediately sprinkle with chocolate chips. Let stand 2-3 minutes to melt then spread chocolate over bars and sprinkle with nuts. Cut when cooled. Sweet, tart, and custardy, these easy bars are the lemon pie of cookies. This recipe is delicious and so easy! I didn't use the walnuts, but that's all I changed and it was wonderful. The smell had my husband begging for them straight out of the oven. didn't have the toffee flavor i was looking for. the chocolate topping was a bit overwhelming. 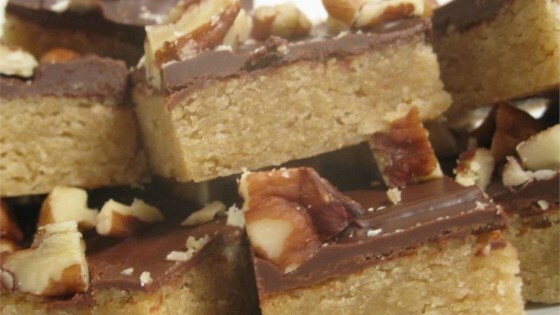 it was easy enough to make, but ended up tasting more like a cookie bar than a toffee bar. I've been making these for two years now and they are awesome! Also extremely easy to make! Great for the holidays! Tasty!!! These are like a soft toffee-flavored cookie bar with a hint of chocolate. Soooo good! Will totally make these again!! !